Should Christ look like a tennis player or movie star? That was the conclusion of the French philosopher Jean Baudrillard, after visiting Salt Lake City. (See: Jean Baudrillard, America.). Like Alexis de Tocqueville before, in 1988 Baudrillard travelled through the United States to describe Americans as they were. Although not meant as a compliment, his comparing images of Jesus to a tennis champion was an important observation: Christ looked like a popular figure. Whether artists are aware or not of the phenomenon, the image of Christ is highly subject to the contemporary understandings of what the perfect man looks like. This argument is a medieval Christian adaptation of neoplatonic aesthetic theory that suggests an artist, in order to paint the truth, must be free from sin to receive inspiration. (This origins and developments of this theory are extensively charted by Erwin Panofsky in his book Idea.) Being worthy, the artist is not to copy directly from nature — the fallen, sinful world — but to appeal to God directly. (For an example, read “Rules for the Icon Painter,” PDF document.) The resulting eternal image should therefore avoid distortions of mortality. This notion of God placing an idea directly in the mind of an artist is particularly appealing to Mormonism, which espouses not just the possibility of personal revelation but the necessity of it. In retrospect, I was being patronizing like Baudrillard. My argument was: I am a good Christian — at least comparatively good to many others I know; I celebrate the Lord’s birth; this year, as part of my celebration, I bought an iPad for my children; therefore, God inspired me to buy the iPad. Its not a perfect argument. But, it is a an example of how difficult it is to avoid one’s time and place in one’s religious expression. A better example is my experience visiting the 2009 Art & Spirituality Exhibition at the Springville Museum of Art. Held every year, it is perhaps the largest show of contemporary religious works in the country. Though the show often includes works by Hindu, Buddhist, and other Christian artists, the Museum’s location in Utah Valley and long association with Mormons means the preponderance of art submitted is LDS. At the exhibition in 2009, a special effort was made to invite prominent artists from years past, whose work was on display in the Museum’s largest gallery in chronological order from the mid 1970s to 2009. 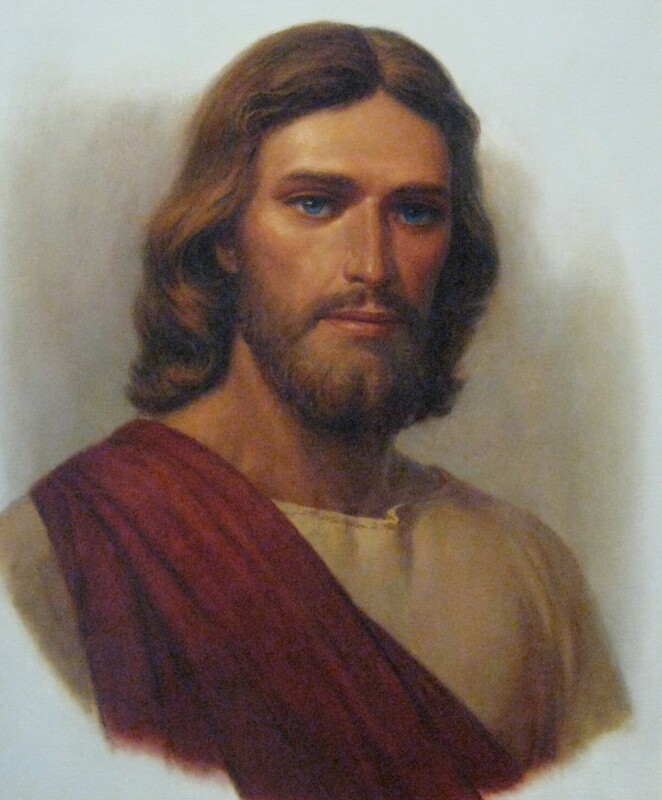 There were at least fifteen paintings of Christ by Mormon artists lining the wall. I’ve reproduced a few below. The Christs painted in the 70s, or by artists of that era, looked like they were from the 70s. The hair was wispier and natural, the face slim, the face was thin. He could have been a member of ABBA. The Christs painted in the 80s, or by artists of that era, looked like they were from the 80s. Some palettes turned from earth tones to electric blues. The hair was tamed, including the beard which was closer to the face. The jawlines were stronger, not unlike Arnold Schwarzenegger, Sylvester Stallone, Tom Selleck, and Ronald Reagan, then prominent male role models. The Christs painted in the 90s, or by artists of that era, looked like they were from the 90s. Christ became less rugged and more beautiful, even androgynous — think Brad Pitt and Tom Cruise, the decade’s pretty-boy leading men. And, the Christs from the 2000s looked like they were from the 2000s. 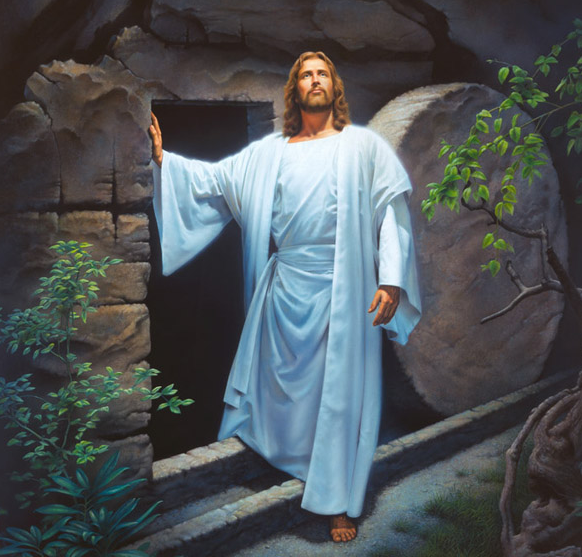 By this time, the figure of Christ took on a prominent v-shaped upper body, as if he had been weightlifting. But, he was not intimidating. In fact, the narratives changed too. Rather than placing Christ in a three-quarters portrait, he began interacting with people more . . . hugging or offering to hug everyone n sight. It would be fascinating to correlate these depictions with the use of anti-depressants and the phrase “tender mercy.” If religion is the opium of the masses, then, for Mormons, Christ is becoming Prozac. 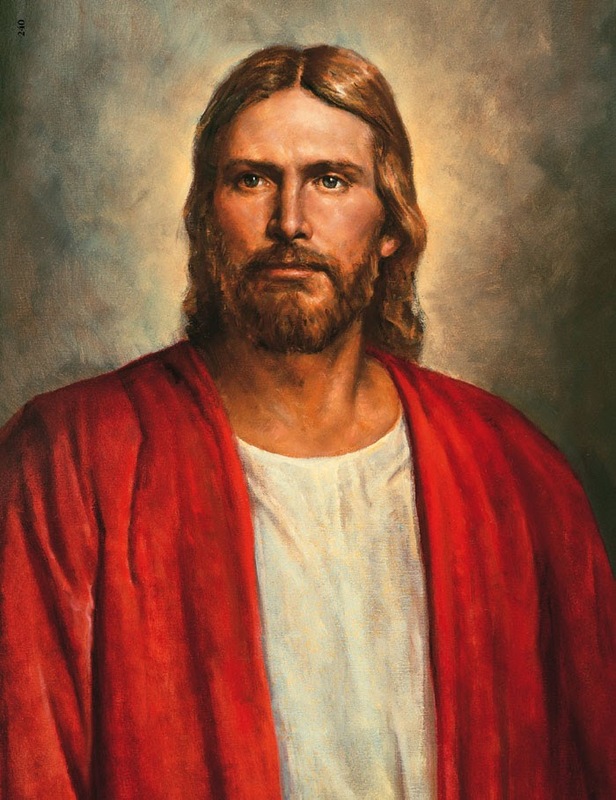 In other words, each Mormon’s depiction of Christ seem to be informed by the cultural understanding of the perfect man. It is why Jean Baudrillard could see a famous tennis player in Mormon art. The depiction of Christ is symptomatic of what we think and talk about; what we value. Have you ever seen a Mormon depiction of Christ pushing the moneylenders out the temple or the cursing the fig tree? I haven’t. Have you ever seen a Mormon crucifixion? I’m pretty sure we believe that He was crucified, although I have only seen one painting about it by Brian Kershisnik. How often do we talk about those subjects? I believe there is a directly relationship between what we talk about and what we paint. 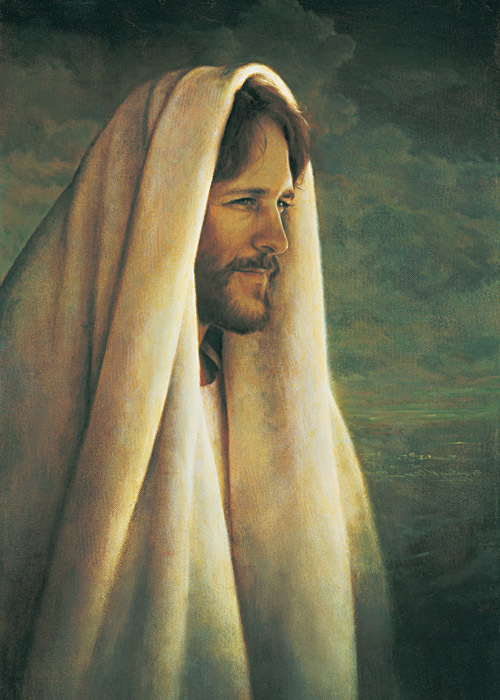 We then are left with the conclusion that by attempting to paint the perfect man, Mormon artists limit Him by their highly fluid understanding of perfection. That’s the negative way of saying it. Perhaps this is simply God speaking to Mormon artists “according to their language, unto their understanding.” (2 Nephi 31:3). Maybe God wanted artists to painted Bjorn Borg because the tennis champion conjures aspirations of greatness. The question for me is not does the image of Christ change? Of course it does. The questions is: Can and should artists avoid that change? 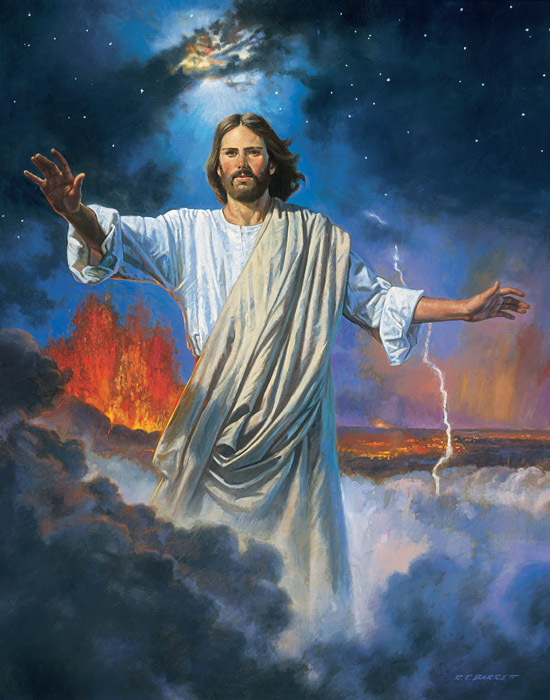 Should artists, and Mormons in general, embrace the notion that their understanding of Christ is constantly changing, and is both influenced by their religion and time? Maybe painting Christ is an extension of our understanding of Him; and, like, any other doctrine, the ability to understand or depict Him grows line upon line, precept upon precept . . . you know, like they sing in that timeless masterpiece Saturday’s Warrior. What is the Temple Art Committee? I know several members of the Temple Art Committee well. Over the years, I’ve also interacted with many artists whose work has been accepted and declined for use in temples. Below, I have reconstructed four conversations that, I hope, will clear up much confusion about how art is chosen for temples. Most people have never heard of the Temple Art Committee. But, for those of who have, few subjects elicit more gossip and frustration. The Temple Art Committee is the bottleneck through which all art hung in LDS Temples is passed. Many artists have spent careers submitting work to the Committee hoping for the Church’s imprimatur on their careers. Few have successfully had a work approved by and even fewer are permanent inductees to that pantheon, no longer subject to the Committee’s approval. Very little is publicly written about the members or workings of the Committee. Its meetings are closed. Its deliberations are not made public. And, frustratingly for many artists, the reasons for accepting or declining a work are generally not explained. This lack of transparency breeds confusion. I could tell stories — lots and lots — about how artists have been unfairly treated. I am sure that just writing this article will prompt others’ stories to be shared in the comments. The purpose of this post is not to air grievances or create a “gotcha” moment for members of the Committee or the Church. For this reason, I have deliberately left out the names of individuals who were kind enough to talk with me. (I don’t want them receiving a deluge of emails from readers, nor reprimands from their colleagues.) The purpose of this post is not even to offer solutions. Instead, I just want to explain what I have learned over the years through conversations with artists and various people involved with the Committee. CONVERSATION ONE: WHAT DOES THE COMMITTEE DO? First of all, it is not officially called the “Temple Art Committee;” although that is what I have heard others, including Committee members, call it for the past fifteen years. Officially, it is called the Art Evaluation Committee (AEC). The AEC, is comprised of eight appointed, unpaid volunteers and a few Church employees. These employees work for the Church architect, and are there to put forward the needs for each temple. Of the eight appointed volunteers, four are local art dealers based in Salt Lake City; three are former or current directors of Utah museums. One is a retired professor of art. Six of the eight have sat on the committee for more than twenty years. Me: Are there term limits for Committee members? Expert Witness (EW): Yes, there is an original document that was written in the 1980s, when the committee was formed, that set down term limits. But most members have far exceeded the time limits. EW: It’s hard to know. They all have very good intentions. The AEC meets quarterly (i.e. every three months). The concerns of the AEC are principally about the artistic merit of works that have been proposed for a particular temple. Me: Do you often have well-meaning but bad submissions? EW: Yes, many are well meaning and driven from a deep sense of spiritually. EW: If we make a decision to decline a submission, we have to be careful. Some artists feel that their works are meant to be in the temple. We try to reassure them that the Committee’s decision to decline their submission is not a reflection of their testimony or spirituality. In a Church where the line between communal and personal revelation is often overlapping, these kinds of conflicts are inevitable. For artworks in temples, the AEC draws that line. Setting aside these obvious non-starters. Me: How many paintings do you see in a given meeting, on average? EW: Somewhere between 25 and 40. Two thirds of those are by contemporary artists. Me: Where do those paintings come from? Are they submitted directly by the artist? Dropped off at a desk? EW: Those works are usually advanced by designers or someone on the Committee. Me: Who do you have to know? EW: About 85% of works come from temple designers or members of the committee. Me: Who are these designers? EW: Each temple project is assigned a designer, who is responsible for doing the interior decorating from furniture to lighting to paint to artworks in a particular temple. The designers, and sometimes committee members, approach artists they know and semi-commission artists to conceptualize a work for a particular temple or place in the temple. Committee members and designers know about an upcoming temple project. The Commitee member or designer reaches out to his or her network of artists for help. There is a back and forth between the designer and sometimes more than one committee member. The work is brought to the quarterly AEC meeting. All of this happens before a work is voted on by the AEC, which does not have the power to pay anyone or, even, make a final decision for the approval of a work. Me: Are the artists offered any guarantees of pay for their work? EW: Muralists are generally given retainers. But, at this point no one else is. I think there should be retainers for other artists, especially figurative artists, because their work requires so much time. For now, that is how it is. Me: Does this affect the kinds of works that are submitted? Do figurative artists feel that its simply not worth it? EW: We are losing our figurative artists. We have more than an adequate number of landscapes submitted. There are several cases of figurative artists moving to landscape. As a result, the concern is that we are not going to have enough figurative artists in the future. I think the only solution is to give those figurative artists a retainer. Any painting approved by the AEC is then passed on to the Temple Facilities Sites Commitee (TFSC) for financial approval. The TFSC, as far as anyone I talked to can determine, is comprised of members of the Church Architecture, Engineering & Construction Division and a representative of the Presiding Bishopric. The TFSC is principally concerned with the cost of paintings. If a painting passes the balance-sheet test, it is shown to the final decision makers: The Temple Sites Committee (TSC). The TSC is comprised of representatives of the of the Presiding Bishopric and the First Presidency. They briefly discuss each painting and give their final approval or disapproval. This is not the only work on the agenda. Fine art is only one aspect of building a temple. The existence of these committees and, more specifically, the lack of communication between them is the source of a lot of tension. At this point, I ask if each painting only gets one chance to go through the various committees or if artists are able to amend their works and re-submit. Apparently, this is fairly common for some works; but, due to the hierarchical nature of the operation, the process is difficult. EW: Sometimes we will spend 20 to 30 minutes talking about one work of art; passionately discussing its merits. While all of these discussions are recorded in the meeting’s minutes, they are not generally shared with the other committees, who are usually not as familiar with the art or issues as we are and do not understand why we approved it. The work is often declined. Me: Are you given reasons for why it is declined? EW: Most of the time we don’t necessarily know. The implications are troubling, but not surprising. The lower committee, although comprised of professionals, is engaged for its expertise. Yet because its members are not general authorities, their suggestions are passed on, stripped of the rich discussions that led to a collective conclusion. The works are then re-deliberated (i.e. re-tried) in the other committees — whose members have little-to-no expertise in the arts — coupled with the pressures of making many other decisions. Understandably, the conversations held in these other two committees — because of the people involved — are not to be shared outside of that particular meeting. Only the resulting decisions are passed on. I was told by one AEC member that one general authority doesn’t like blue and another doesn’t like green. Me: Sometimes, do you find yourself only able to recommend red and yellow paintings? Me: Are there written guidelines for what can or cannot be in a painting? EW: No. We can only surmise by what has been declined. Me: What are some considerations you have gleaned about what will not be approved by the other committees? EW: No shadow on Jesus’ face. Paintings can’t be too dark. You cannot have a painting showing the moment before the miracle or during the moment of conflict. It has to be after. The resolution; never the conflict. Works can’t be too Tonalist; too moody. Me: Give me an example? EW: We would have trouble getting Carl Bloch’s works approved. Maybe The Pool of Bethesda [currently at the BYU Museum of Art]. But, wait, the beggar would have to go. Too dark. EW: Well, these are very much mood paintings. They don’t want anyone walking through the temples and be overpowered by a work of art. The emphasis should not be on the artist but on the Temple space. It is understandable that there are no hard and fast rules about what a work of art should or should not be. In fact, if there were some list of guidelines indicating what was allowed or not allowed, it would surely be controversial. How can anyone create a formula for what is or is not a good work of art or “temple worthy.” However, the lack of such a document or any rules then creates another set of problems. Me: What do you tell an artist whose work has been declined? EW: I have been assigned to artists who have had works declined and I didn’t know what to tell them. Within the process, we are trying to be advocates for the artists and to counsel them. But, we really don’t know what to tell the artists. It is so disheartening we don’t have enough information to tell them — valid or invalid — specific reasons for a work being declined. When talking about the Art Evaluation Committee, most are inclined to side with the artists, who have often faced unclear and unmet expectations. But, if one were to take the role of a marriage counselor mediating the needs of each one in this somewhat dysfunctional but necessary relationship, it would be unwise to simply label one side of that relationship with blame without first understanding the motivations and causes for that behavior. It is my hope that this post will have done something to lay those motivations and behaviors more clearly in the light, if only to push the conversation — and potentially change — forward. If you could have a conversation with a member of the Art Evaluation Committee, what would you ask? Take a da Vinci or a Michelangelo or a Shakespeare and give him a total knowledge of the plan of salvation of God and personal revelation and cleanse him, and then take a look at the statues he will carve and the mural he will paint and the masterpieces he will produce. I believe that focusing on the artist is premature. Long before da Vinci or Michelangelo, in Italy there was a dynamic culture of patronizing painters, sculptors, and architects that were — at first — considered little more than craftsman. But as the highly competitive and intellectual tastes of the Florentine, Venetian, Neapolitan, and Roman elite increased, so did the status and output of artists. So whenever I hear the question “Where is the Mormon Michelangelo?” I want to ask: “Where are the Mormon Medici?” The current market for Mormon art and purchasing practices of the Church will be described at length in future posts, but it is clear to me that we are not yet at Renaissance levels of investment epitomized by the Medici family, who bankrolled many of Michelangelo’s projects, not to mention many other artists of the time. If we eventually have a well funded Renaissance, it begs another question: Where would we put the resulting art? Do we have the equivalent of a Sistine Chapel ceiling, ready to be painted with The Creation and Last Judgment? The answer is not simple. Some of the most sacred places in Mormondom are visual deserts, deliberately void and denuded of strong figurative art. I have never seen a work of art in a Celestial room. And the remaining interior real estate of temples tends to be dominated by landscapes, with and occasional original or giclée reproduction of figurative works. The same may be said for chapels. With the exception of only two early-twentieth-century ward houses, I have never seen a meetinghouse with a painting larger than a chalkboard, let alone a work of art within the sacrament meeting room. It is my guess that if one were to enter the Celestial Room and see Michelangelo’s expansive, colorful, multi-figural Sistine Chapel ceiling — or its Mormon equivalent full of modestly-clothed, de-winged angels — it would potentially be a huge distraction from the rituals of the temple. Celestial rooms are deliberately non-distracting environments. Even the furniture is often white. The same is true for a sacrament meeting. Members are meant to focus on the revealed words of the sacrament prayer; not a visual representation of it. In this sense, Mormons may be considered iconoclasts. 1. Where are the Mormon Medici? 2. In what venue would Mormons display their version of the Sistine Chapel? James Driessen on What is the Temple Art Committee? Ben Carlsen on Should Christ look like a tennis player or movie star? Ryan Brown on Should Christ look like a tennis player or movie star? Mahonri Moriancumer on Should Christ look like a tennis player or movie star?